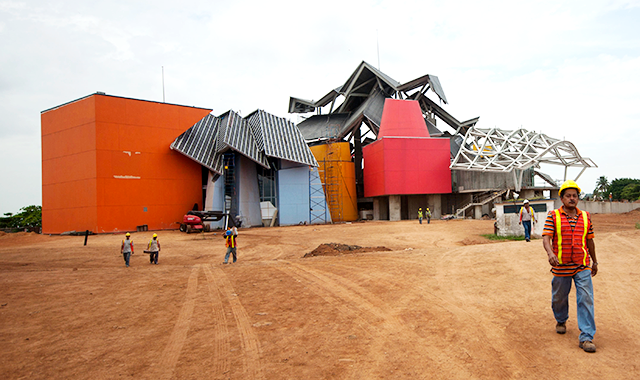 Gehry Goes South: Can the Starchitect Recreate the Bilbao Effect With Panama's New Bio-Museum? With the arrival of Frank Gehry's twisting, titanium-clad Guggenheim Museum in 1997, the small, shipbuilding town of Bilbao became a cultural destination, its name forever bonded to a dreamy urban renewal scheme known as the "Bilbao effect." Fifteen years after the completion of the Guggenheim Bilbao, Gehry is on his way to finishing his first project in Latin America, the Museum of Biodiversity (or Biomuseo) in Panama City, where conviction in the power of iconic architecture has been renewed. Officials at Biomuseo have high hopes that the Gehry-designed building will emerge as "a new icon for Panama" when the decade-long design, construction, and approval process comes to a close this winter. Gehry -- whose wife is Panamanian -- has applied his signature formal fragmentation to create an eclectic and deliberately iconic structure, one that collages shape and color with the same caprice as a wide-eyed child in art class. Asymmetrically protruding, squiggling, and contorting canopies overlap like pieces of tinted cellophane, corrugated cardboard, and construction paper, catching the eyes of visitors arriving to the city by cruise ship. Within the museum are rainforest-like gardens and biospheres designed by Bruce Mau Design in conjunction with scientists from The Smithsonian Institution and the University of Panama. As the exhibits will communicate, the emergence of the Isthmus of Panama three million years ago catalyzed a major change in biodiversity on a global scale. Ocean currents shifted, continental climates changed drastically, and animals migrated to new territories. Located in the alleged epicenter of biodiversity, Panama's Biomuseo strives to tell compelling stories about nature's wonders and thus stress the importance of their safeguarding. Gehry's building -- dubbed "The Bridge of Life" in reference to the isthmus -- shows no trace of this ecological agenda. Where one might expect a living wall or the faintest figurative nod to a bridge, there are only colorful, hovering fragments. The building appears as if it were designed with its future line of gift shop souvenirs in mind, more so than the actual imperative of the museum. But this is because the museum has two imperatives, an ecological one and an urban one. For the Bilbao effect to work in Panama, Gehry's "Bridge of Life" will need first and foremost to communicate a consumable image, not an idea.